Philip George Chadwick (1893-1955) was born in Batley in Yorkshire, and was an insurance broker’s clerk at the time of the Great War, during which he served with the 2nd Artists Rifles. 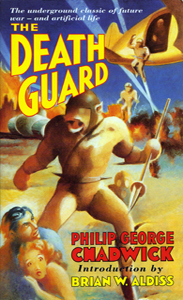 His only novel was The Death Guard, which was published in 1939 and the stock of which was largely lost during the blitz. It was reissued in 1992, with an enthusiastic introduction by Brian W. Aldiss. It is about a race of lab-grown vegetable-derived androids, “The Flesh Guard”, controlled by a fascist government in Britain, and about the war which is unleashed when other governments react to this threat. The above information is from the Encyclopedia of Science Fiction. Wikipedia adds that the author was a Fabian socialist, and a disciple of H.G. Wells, although he was later an Independent. The book was apparently written not long after the Great War, but not published until the eve of the Second World War; there is a legend that Wells regarded the book very highly. It was apparently not until the paperback printing of the book in 1992 that it was realised that Chadwick had lived until 1955. He died in Brighton.